Cool work. Is plotter modification described somewhere? No, I should, though. The hardware control panel is a raspberry pi with a 10-key USB keypad and a ridiculous python program that renders its own UI as PNG frames. Much more important is a set of patches to inkscape that render svg down to simple strokes for hpgl, including pen changes and Hershey font substitution. I have a web service that consumes CSV, runs them through inkscape, and deploys them to a directory on the rpi. Unfortunatelyare a bit messy and apply to a several year old version of inkscape. I keep meaning to update the thing, but … time. Nice. Converting SVG to HPGL will be my challenge in two or three weeks, do you have any good resources to share? happy to see they’re still around! Oooo, I didn’t realize these could be traced with a pen plotter, I’d been printing them with a large-format designjet! Simon Tatham’s portable puzzle collection “Loopy” has a whole bunch of other plane-filling tesselations which could be fun to also use here, beyond these hexagons, squares, and triangles. Another fun way to keep your plotter busy is to have it draw Dragon curves. 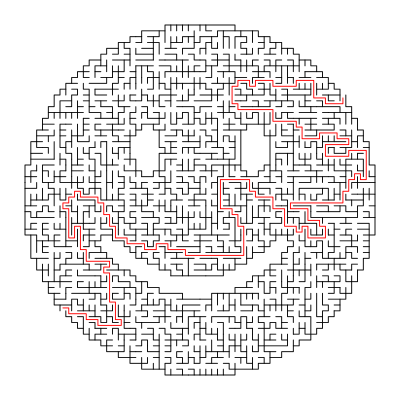 What would you pluh the code into to generate these mazes? Mostly a mechanical kind of guy but I’m trying to pick up more on things of this nature. Please forgive the noobness and happy holidays all! Back in 199x I bought an old HP plotter. I thought.. Linux has drivers for EVERYTHING and maybe I can fit it with an etch-resist pen and make some PCBs. I didn’t know what HPGL was, didn’t find anything that I knew how to recognize as a driver for it. Being that this was before Arduino or other hobbyist microcontrolers replacing the electronics with something that I did know how to drive was beyond me. Lacking home 3d printers I wasn’t even sure where I would get the bodies for new pens! (I don’t count the BA$IC $TAMP, note the use of dollar signs, those things must have been made of money given what they cost). I really wish I had kept the thing today! Who knew how much would change and how fast?!? I expected that old gear to become even less useful, not more!